The first true sign of spring on the farm is when rhubarb pokes it's leaves up next to the garden beds. It seems as if I just blink my eyes and the ruby red stalks are ready to harvest. Then, it's a flurry of activity for a few weeks, and I make as many recipes using the tasty food as I can. The rest goes into jam and then frozen in chunks to eat throughout the winter. I even manage to give the plants themselves a chance to go to flower (now, THAT'S weird to see) and allow the insects to hang out in safety for the rest of the season. Rhubarb gives my family plenty of food, so I give high praise to this nearly wild food. 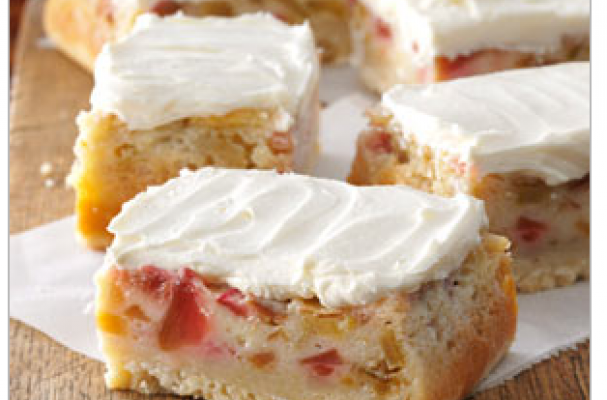 Here is a recipe for Rhubarb Custard Bars that was shared with us from Taste of Home. These bars are truly magnificent and remind you that spring is a time of abundance and fresh eating; especially on the farm. The eggs come from our chickens, the milk/cream for the custard is from our dairy goats, and the rhubarb is right outside the kitchen door. Winter's cold fades in our mind with every bite. Enjoy! For the complete recipe, see it here.